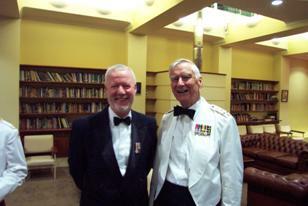 It was indeed a pleasure to attend the Regimental Dinner on 8 May. I valued the chance to catch up with some old comrades and to talk to some of the serving members. In the last newsletter I appealed to members to permit us to borrow photos so we can electronically store them in our historical collection. Recently I had great pleasure to receive a photo from Ken Gaulton. The photo was taken during Ken’s command. It shows Ken, Major General A.L. 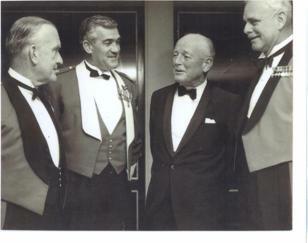 MacDonald, Sir Alan Mansfield and Colonel Sir Charles Barton. Thanks to Ken for allowing us to gain access to this piece of history. I again appeal to anyone to permit us to gather the valuable history of the Regiment. A CD containing photos from the Association’s historical collection is available for the small cost of $10. Please contact me should you wish to purchase a copy. The sale of history and photos raises the funds we need to preserve the historical items in the future. 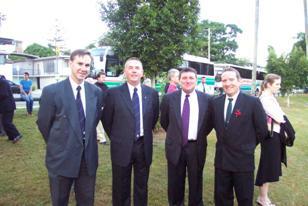 The Association was also well represented on Anzac Day and the Regiment again presented themselves very well. 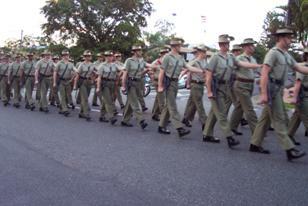 The Band and the Regiment march down Sylvan Road to the Anzac Day ceremony with Toowong RSL. I would like to remind you that the Annual General Meeting of the Association will be held on 17 September 2004 at the United Services Club. In the last newsletter I was delighted to inform you that Paul De Jersey had accepted our invitation to talk at that dinner meeting. Details of the meeting are set out within this newsletter. We are still continuing to slowly develop the website for the Association. I would again like to recognize the work that Peter Morton has competed to get the site to its present excellent standard. The ability to now communicate the newsletter by EMAIL and to use this website has reduced our postage costs. These funds also can now be channeled to the preservation of the history. I look forward to meeting you all again at the Annual General Meeting and Dinner. It has recently been announced that the next Commanding Officer of QUR, with effect from March 2005, will be Lieutenant Colonel Nan Bahr. Doctor Nan Bahr is a Senior Lecturer within the Education Faculty of the University of Queensland. Nan was commissioned in South Australia, but she has served for over twenty years in South East Queensland in the Corps of Military Police. Nan often played with the QUR Band in her days as a subaltern, assisting with her extensive professional knowledge of music. She has commanded a sub-unit within the 7 Brigade's combat support unit, and has been Chief Instructor of Officer Training Wing at the Regional Training Centre since January 2003. The role of QUR has recently been expanded to encompass training staff cadets to become GSO officers in the General Reserve, OTRS staff cadets to become GSO officers in the Australian Regular Army, train OOC's for the Australian Army Cadets and to provide other training as directed. 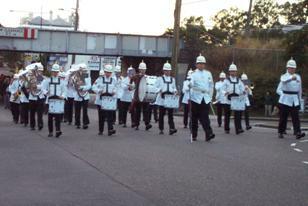 This is a very wide role and in part demonstrates the pace and spectrum of activities the regiment does. 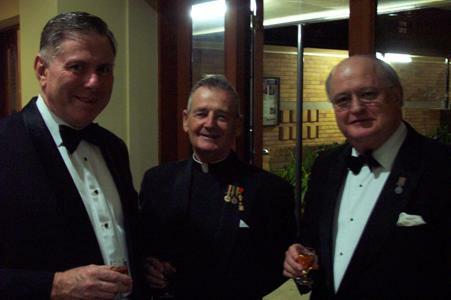 The Regimental Dinner was a success in May. We had many new faces including some recent graduates come to the dinner. It was held at St Lucia and at Cromwell College which again provided a fine meal and atmosphere. Afterwards the Officers Mess provided a venue for a night cap or cleansing ale for some hours after the meal had concluded and many enjoyed the night. The COLRES from RMC was a late invitee to be the speaker for night and provided a rousing talk. It was good to catch up with so many of the friends and members of the regiment. Three selection boards were completed in May and June which gave the regiment almost 20 new Staff Cadets. Most have just successfully completed the 3A1 module we ran at Enoggera in July. This module covers all the basic skills such as drill, weapons and first aid and is a very intensive start for their training for many Staff Cadets. It has long days and nights covering what are new skills for most. We had Cadets from all over Australia attend and all commented favourably on the quality of the course and staff. Capt Ian Devereux was the SI and together with his team did a sterling job in bringing these new people into the start of their journey to becoming officers. Capt Mark Sonter and his small team ran an Officer Of Cadets Officers Course during the same time and trained nearly 25 OOC Officers. This is a challenging course with a wide spectrum of ages from young adults to mums and dads many of which have no previous military training. I attended the RMC Bi-annual Training Seminar in Canberra. This is held twice a year and the CO's from around the country get together to discuss common problems and develop joint solutions. We are all facing the same challenge of recruiting sufficient number of people to staff and train within our units. We are all short of soldiers and NCO's and struggling to conduct training which maintains the dignity and safety of our trainees. Colours and embellishments for all university regiments were under discussion recently but I can happily report that both will remain as is. In fact RMC will be moving to remove some anomalies in ASODs to formalise current practices. We are in the build up to the busy period of courses to be run from December till February. At this stage we expect to send nearly 30 staff cadets to the final modules at RMC early next year and we wish them well in those final courses before graduation. The incoming CO has been announced and I wish Nan Bahr every success in her appointment. She will take over the premier officer training unit just after graduation in March 2005.
q I will be attending the Association’s Annual General Meeting Dinner to be held at the United Service Club, Wickham Terrace, Brisbane on the evening of Friday 17 September 2004 at 1900 for 1930 hours. q My cheque for $65 payable to the QUR Association is enclosed. 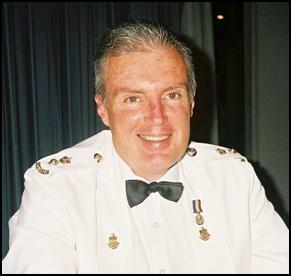 The Australian Defence medal is a new medal that recognises volunteer service in the Australian Defence Force for six years continuous service. Regular or reserve service will qualify. Eligibility will be based on serving six years with at least 20 days service in any year. This accords with the Defence Long Service Award provisions for service after August 2000 that are based on eligibility criteria for both regular and reserve members of 20 days per annum. Eligibility will begin at the end of World War II. Provision will be made within the guidelines for personnel who die or are totally and permanently incapacitated as a direct result of training, who have not reached their 6–year qualifying period. 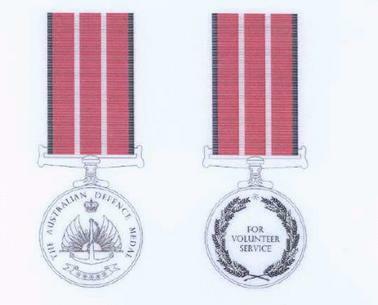 The obverse of the medal is based on the WWII Volunteer Service Badge, awarded to all Armed Forces personnel who did not receive the Returned from Active Service Badge. It includes the Crown denoting the Sovereign, the wings of the RAAF, overlayed by the Army Rising Sun, and the RAN Anchor. The Reverse includes an Australian wreath of wattle with the Federation Star at the top centre. The words ‘FOR VOLUNTEER SERVICE’ appear in the centre of the device. The Ribbon is a black and red colour of the Flanders poppy representing the Anzac spirit of the Australian Armed Forces. The white stripes divide the red into three, denoting the three services. The white stripes also denote peacetime service.